Modified cars can become a way of life and enhance the look of the car you have. For some people, a car modification is to be done so that they can be the center of attention, whether they are driving or when parked somewhere. In addition to beautifying the appearance of their cars, modifications can also improve the performance of their cars. Modifications can be made ​​as desired. Some people choose to modify some parts of the car that they think is not good, to be better. However, there are some people who modify their cars with a total so that the original form of the car we can hardly recognize. - Define your style modification. Before you modify your car, decide which style would you choose for your modifications. if you want to modify the style of vintage, classic, and modern. - Select the component you want to modify. Make sure you plan any components that you want to modify according to your style. Do you want to modify the interior alone, or along with the interior of your car sound system. - Determine the budget you have. Make sure you have a budget plan that would you spend to modify your car. If you do not make the right budget, the modification will be stopped in the middle of the road and this will make your car look more ugly than the beginning. If you want to modify appropriately, you can choose a modification of the original Toyota. Modification of the original Toyota will not make your vehicle performance decreases. With a formal modification of the manufacturer, you will get a mix of beauty cars that have been modified, and ensure reliable performance. We all know that Toyota is a reliable car in all terrain. Therefore, we do not need to modify too much. Enough with the appropriate modifications to the components that have been issued by Toyota officially licensed, then your car will look more beautiful without having to worry about the performance of the car. Appropriate modifications to the original components from Toyota, will make your Toyota car better. 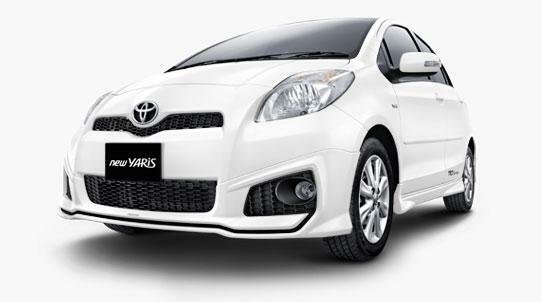 We take it for instance, Toyota Yaris series, we attach original parts manufactured by Toyota. Obviously this will make your car look nicer.